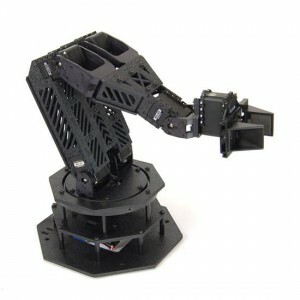 Check out our new PhantomX Robotic Arms! We’re proud to unveil our new arms, the PhantomX Reactor Robot Arm and its little brother the PhantomX Pincher Robot Arm. These arms are based around the Dynamixel AX-12 Robot Servos and are controlled with the Arbotix RoboController, so you have an amazing amount of control over these arms. The Reactor Arm also has a ‘Wrist Rotate’ option, to add another level of functionality to your arm. Stay tuned for more videos about the design of this arm, as well as examples of all of the amazing things it can do.